COME winters, farmers in 50 districts of the country will be covered by an experimental crop insurance scheme by the Centre. The new scheme is a modified version of the current programme with new features like providing indemnity and advance relief to farmers. 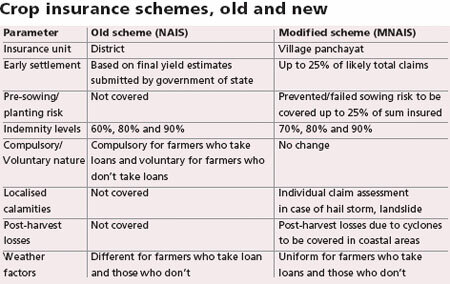 The unit area for the new insurance scheme has been reduced from a district to a panchayat. Farmer unions said the government should have covered individual farmers. The Cabinet Committee on Economic Affairs on September 16 approved the implementation of the Modified National Agricultural Insurance Scheme (MNAIS) in 21 states on a pilot basis. If MNAIS, with a budget of Rs 358 crore, is successful it will replace the ongoing National Agriculture Insurance Scheme (NAIS). Under the new compulsory insurance farmers can get loans and advance relief of 25 per cent of the insured sum before final settlements. This will avoid hardships to the farmers, an agriculture ministry official said (see Crop insurance schemes, old and new). Calculating insurance claims on the quantum of crop failure at the panchayat level rather than at the district level will ensure better reach to farmers, the official added. Farmer unions do not agree. Dharmendra Malik of Bhartiya Kisan Union said for the past five years farmer unions have been urging the agriculture ministry and the Prime Minister’s Office to insure individual farmers. “If a particular district or panchayat is not declared drought- or flood-hit and even if a sizeable number of crops fail, then farmers cannot claim compensation,” said Krishan Bir Chaudhary, president of the Bharatiya Krishak Samaj (BKS). Another problem Chaudhary pointed out is that crop failure due to poor quality seeds, spurious fertilisers and pesticides, are not covered under the modified insurance scheme. Citing an example, he said that in 2009, Bihar cultivated the Cargill hybrid 900M maize seed provided by Monsanto India Limited; it failed miserably. An Indian Council for Agricultural Research (ICAR) report found the seed unsuitable for the climate. “If these things are not checked or covered, how would a farmer benefit?” he asked. In a reply to a Right To Information application, the Ministry of Agriculture said claims worth Rs 18,395.53 crore benefited 44.8 million farmers between 1999 and 2009. SS Raju, senior scientist with the National Centre for Agricultural Economics and Policy Research, said there are 120 million farm holdings in India and only 15 to 18 per cent of them are covered under the NAIS. 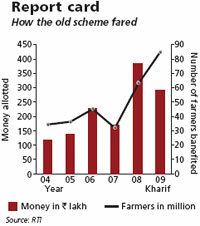 Raju, who recently wrote a book on crop insurance, admitted that claim settlement needed reforms. He said untimely claim settlements because of the red tape prevent farmers from enjoying benefits of the crop insurance scheme. Malik added that for claiming insurance, a farmer needs a weather report from a revenue officer and must submit it within 30 days. It is difficult and time-consuming to get the report and collect papers. The insurance claim should be given before sowing of the next crop, he said. 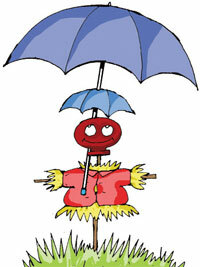 Most farmers are unaware they are covered by a crop insurance scheme. Districts for the pilot were decided on the basis of proposals states sent to the Centre. States not covered can send their proposals for inclusion in MNAIS, the ministry official said.